Collectors are bound to love The Encyclopedia of Early American Sewing Machines, Second Edition. The first edition of this book, self-published by author Carter Bays in 1993, sold more than 3,000 copies, and he has totally revamped it for this printing. American sewing machines from 1850 through 1920 are featured in more than 450 large, detailed photographs, half of them in color, and current collector values are estimated. 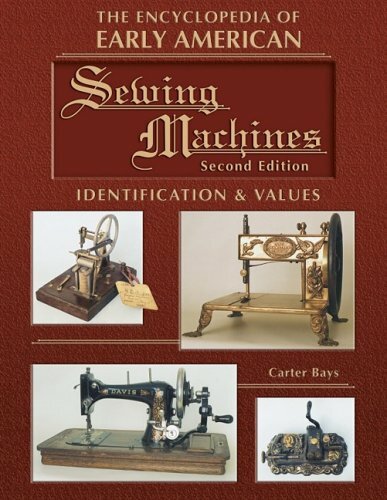 The book traces the history and development of the sewing machine industry from 1800 to after 1900. Almost all known U.S. manufacturers of sewing machines up to 1875 (and several beyond) are highlighted: Singer, Wheeler & Wilson, Shaw & Clark, Weed, Howe, and Holly, to name just a few. Do you own your great aunt's antique treadle sewing machine? This book will identify and give the history of the manufacturer. Specific information is provided on restoring antique sewing machines, and toy sewing machines are also given coverage. This title is sure to become the standard reference for early American sewing machines. 2005 values. Carter Bays, a professor of computer science, has been collecting sewing machines for twenty years and has amassed what is universally regarded as the finest collection in the world of early American treadle sewing machines. He began collecting in 1978 because, "nobody else seemed to be doing it." His goal when he started was to assemble the finest collection in the world of early American sewing machines while prices were still affordable. In that regard, he says that his goal was realized, "in the nick of time."